I worked as a full-time product designer for Cinch Financial. In this case study, I talk about a design that was in progress and being built—improvements to the spending dashboard and bills page—at the time Cinch suspended ops and closed development. I worked full-time on the product design team at Cinch Financial. As I mentioned in my other case study, Cinch closed development and suspended operations. In this case study, I go over some bigger projects that we were working on but didn’t get implemented. If you are interested in some of the work I did that was implemented, head over to the other case study. *If you already read the background from the other case study, then skip to Spending Dashboard stuff. Cinch aimed to provide a personal advisor/pocket CFO, giving unbiased, comprehensive, and automated financial advice to everyone. There, we tackled the beast of personal finance with behavioral economics principles and data-driven solutions. The design team balanced being focused on thinking big and conceptually into the future and implementation sprint-to-sprint to ensure we stayed on track on our roadmap. There were three main parts of the app that users could navigate to: Advice, Spending, and Snapshot. Users went to Advice for guidance. We’d take the information they provided via self-answered questions, linked accounts, and credit score and give them advice on areas of their finances like credit card debt, auto insurance, student debt, life insurance, checking fees, savings, and their payment methods. Spending was where users could monitor their spending and the budget we automated for them. They could see their Pocket Money (how much money they had to spend), their Safety Net (money they should be putting aside for the “uh oh” moments, savings, credit card pay downs, and goals), bills, income, and transactions. Snapshot was the high level look at the user’s accounts and assessments over the past 90 days—debt (debt and credit), reserves (available cash), consumption (money in/out flows), and protection (life insurance coverage). We’d give you the facts of your situation and then your personalized options to better it. At the top of the advice dashboard, we gave you your assessment on each of the four pillars we used to measure financial health (debt, savings and reserves, consumption/balance of money in/out, and protection and life insurance coverage). Under that, we gave you “moves”—cards to go through each area of your finances to make changes in. And at the bottom, we told you where we were always monitoring (you didn’t have any moves at that time). Note: some of these images are outdated. We asked questions to get a better picture of the user’s financial situation and give more personalized and accurate advice. On the Spending dashboard, we wanted to give you a center to configure your finances. We told you your monthly Pocket Money number in the middle. At the top, you could click into income, bills, and Safety Net to look at those parts of your budget/Pocket Money number. Under the PM number was your overall “how ya doin’?” status that corresponded with the color of the background. Under that, we listed your transactions, where you could click into them and recategorize or ignore them. Pocket Money explanation of how we calculated that number. In Safety Net, priorities could change month to month, depending on the user’s financial situation. If debt was the user’s assessment, like in this photo, then their Safety Net funds were allocated to that. 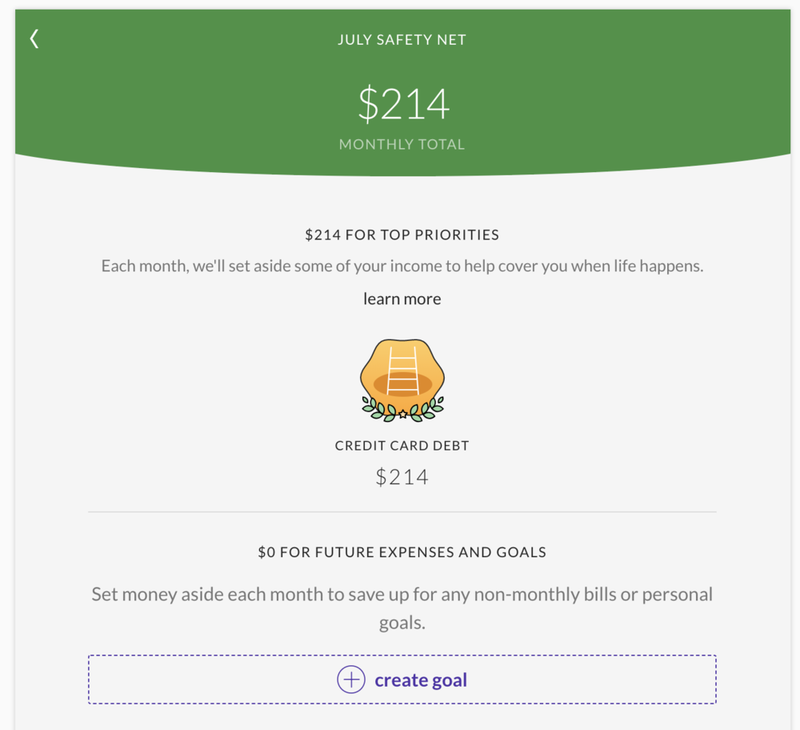 If the user was debt-free but needed to save, another badge would appear for a “rainy day fund.” At the bottom of the screen, a user could create goals, such as a new puppy or vacation, and future expenses, such as a non-monthly bill or tax bill. Snapshot was a high-level look at the user’s financial situation over the four pillars (debt, reserves, consumption, and protection). We chose not to use charts and graphs to take the heavy “finance” feeling out of it, and instead chose abstract images with meaning. These were the most recent background images. For a full day, we held a remote research session with six real users on their experiences with Cinch. Two of our participants couldn’t make it. The following image is the notes grid I created to combine all the observations and see them side by side. The last column is the takeaway from the topic of its intersecting row. Spending needed to be improved to become more of a configurator where users could adjust the information as needed. At the moment, we gave users limited interaction with the components of spending, and it was causing some inaccuracies. Credit card debt and repayment of it shouldn’t be in Safety Net/Savings, it should be in bills. Users’ mental model around credit card payments was not money being put aside, but rather, active and recurring payments each month. Safety Net as the section name was not quite working. Like Spending, it needed a revamp and improvement, as well as the capability for editing and more user interaction/input. Goals was an area for untapped potential. Users were not using it, but would if it had more value. Snapshot held great value as a centralized hub, and that overall, comprehensive look at financial health was important to users. In addition, the end of month review was incredibly useful. The only thing that was lacking was more insight into what that snapshot meant—trends, analysis, behaviors, etc. The work was split up and distributed appropriately among the different tracks. I personally worked on improving the Spending dashboard and bills, incorporating the end of month review in Snapshot, and fleshing out Goals. In this case study, I cover my contribution in Spending. Potential was the word a couple of our users used to describe the Spending dashboard. The building blocks were there, we just needed to add to it. From our research, we found a few problem areas and potential solutions for them. The old transaction list—just Pocket Money transactions and sorting functionality. Users felt that the transactions list didn’t give them the whole picture. Users didn’t understand why they had to click around to see all the types of transactions (in flows, bills, pocket money, credit card payments, etc. ), and it was requiring them to do extra thinking. It was hard to interact with the transaction list in a way that was meaningful, as it was just a sortable list of Pocket Money transactions from the last month. Users had trouble getting accurate numbers because they couldn’t edit or add bills manually. They could only categorize a transaction from a linked account as a bill. Turn the Pocket Money transactions list on the Spending dashboard into a complete list of transactions. Add search and filter by account functionalities in order to interact with transactions in meaningful ways. Users could already sort transactions, but they couldn’t do much else. Transform the bills section into a configurator for accuracy. Users were limited by only being able to recategorize a Pocket Money transaction as a bill. Giving users the ability to interact with the bills section and add offline bills would fix some issues with accuracy. A comprehensive and meaningful transaction list—what more could you want? We wanted to show the sum of transactions, and the sum of dollar amount in/out. I also experimented with flipping the figures. It was too cluttered. We wanted to show the sum of transactions, and the sum of dollar amount in/out. We played with the idea of separating them into in/out upon interaction. However, only having this display upon interaction was inconsistent, and could potentially confuse users. We decided to table that. More inflows than outflows, but I digress. There were small changes we needed to make on the design side. A way to differentiate in the number which is money in and which is money out. We didn’t want to represent it in color because annotations were already different colors, so we chose to add a + to the inflows. Annotations to draw distinctions among the different types of transactions in the list. (Most) Users already knew Spending dashboard to be where the Pocket Money transactions are, so we wouldn’t have annotations on those. We would add annotations to inflows and bills. Those annotations would be differentiated by color. A sum of the transactions upon user interaction through search, sort, or filter. Because the list no longer was just outflows, we had to show both figures—the sum of money in and the sum of money out. We knew we wanted to add filtering and searching, but what did that mean for implementation? Pros: Clean, all on one bar and in one drop down. Cons: Can only see one filter at a time, accounts list could be very long. Pros: This was a much cleaner look. Cons: users wouldn’t be able to sort/filter through their searches. Once I nailed down the requirements and behaviors, I zeroed in on the visual display of the functionalities. One of the last designs. Pros: having two bars did give some breathing room for the rest of the components. Cons: it would break with the rest of our style, as searchable things were never in grey—only white. For search, results were based on the description in the transaction cell itself. Users would type the whole word and hit “enter” before any results would come up. We didn’t want the transaction list to constantly be flickering with results each letter typed. Most of our users were on mobile, so we only had so much screen real estate to use for these functions. I played around with trying to fit it all on one bar, only using icons, hiding until point of need, and other ideas. I made a pros and cons list for the different options. Pros: multiple filter categories. Cons: only one filter per category. It was also very tight and small. Pros: multiple filters. Cons: only one filter per category. It was also very tight and small. Still too tight, and our standard was to use checkboxes when picking multiple items. Pros: multiple filters could be applied per category at a time. We ultimately decided to only have one category—accounts. For filtering, we went back and forth between being able to filter by multiple categories at a time. I included account (by card) and by transaction type (Pocket Money, income, bills). I mocked up examples of both, and we ultimately decided that for this release, we would only have one filter type to start—filter by account. 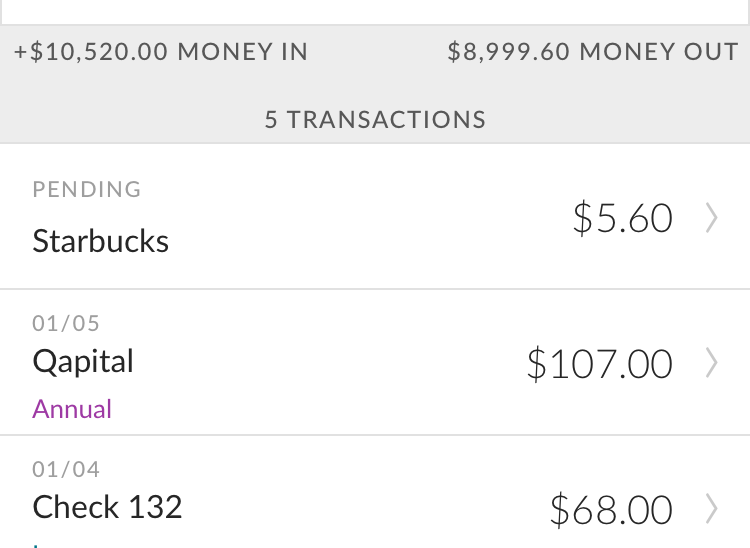 If users wanted to see the specific transactions, they could navigate to the bills and income sections of Spending. It was also tricky to find a representation of what is filtered and the number of filters applied. I had to make sure that we could filter by more than one account at a time, and that the accounts in the drop down were legible and distinguishable. After a few iterations and design reviews with the team, we came up with a solution that worked. For a comprehensive transaction list, we included all transactions—in and out—with colored annotations to distinguish them. Blue was income, purple was bills, and no annotation was Pocket Money. If a transaction was ignored, we changed the opacity of the text and numbers in the cell to 60%. The transaction totals would contain a + if they were inflows. For the search, sort, and filter functionalities, we decided to do two bars—one with search and one with sort and filter—above the transactions. When the user interacted in any way (other than sort) with the transactions, the sum of the transactions appeared. We designed it this way to reduce the mental accounting on the user. If a user is interacting with the transactions list, they are actively looking for something or trying to figure something out that combined the different transaction types. That’s when a sum would come in useful. Otherwise, we kept the Spending dashboard as simple as possible to reduce the cognitive load by giving them one number—their “safe to spend” Pocket Money number. Additionally, We opted to only sum up the amount of money in/out, and didn’t sum up the number of transactions, as it didn’t come up with users during research. The user could filter by account, and the type of account (credit card, deposit, savings, etc.) and last four digits would be listed under the name for easy recognition. We worked closely with the UI engineers to ensure that the interactions with these functionalities would make sense and be what the user expected.